Houses and heavy items are individually priced. 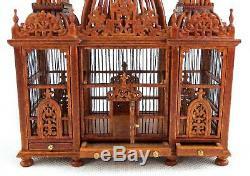 Dolls House Ornate 3 Turret Walnut Wood Victorian Bird Cage with Birds Miniature. Fine Quality - Made by JBM - 1:12 Scale - Wooden - Width - 104mm - depth 43mm - height 135mm = 4.1/8 inches x 1.3/4 inches x 5.3/8 inches. SKU: J5023WN / Barcode: 5060492160694. Brand: Melody Jane Dolls Houses. Our products are not playthings and are not meant for children under the age of 14 years. 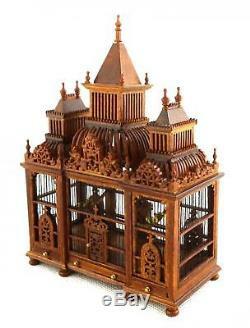 These items are intended for adults to use in the construction and accessorising of dolls houses and similar projects. Use by children under the recommended minimum age could present choking and other hazards. Parental supervision is strongly advised. Over 4,500 Stocked Items With items added every day, you're bound to find what you need! We've got you covered! 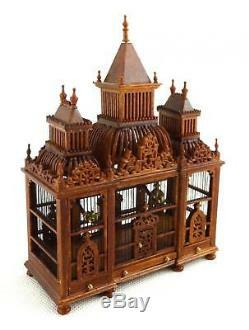 The item "Dolls House Ornate 3 Turret Walnut Wood Victorian Bird Cage with Birds Miniature" is in sale since Friday, December 7, 2018. 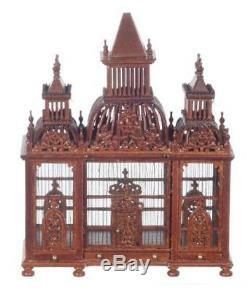 This item is in the category "Dolls & Bears\Dolls' Miniatures & Houses\Pets & Animals". The seller is "melodyw41" and is located in Abergele.